One week of the NFL season is in the books and we finally have real stats to go on. Some teams look ready to take the league by storm, while others just look lost. If your team could use a bit of help, you've come to the right place. The waiver wire picks have whatever you are looking for. Wentz looks like a quarterback that is ready to put up big numbers in 2017. The Eagles are going to be throwing the ball a lot this season; their run game is not good. While that is bad news for their win percentage, it is good news for Wentz owners. Philly went out of their way to get their young quarterback better targets in the offseason. Their moves paid dividends in week 1 as Wentz was 26-39 with 309 yards and 2 touchdowns. All of this was accomplished with Josh Norman shadowing number one receiver Alshon Jeffery. 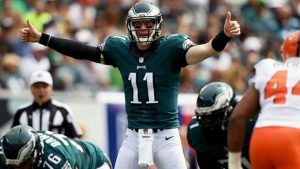 Grab Wentz if he is available because he is going to have a big year. There was a lot of concern about Tyrod Taylor going into week 1 after he lost his top receivers to trades. To an extent these worries were warranted as the passing game struggled. On the other hand, Taylor’s rushing skills still allowed him to put up a nice day for fantasy owners. He scored 21 fantasy points despite throwing for just 224 yards. While that is probably not the floor for Taylor, it is not too far from it. As he gets on the same page with Zay Jones and Jordan Mathews, things will get better. Now is the time to acquire Taylor while he has very little value. One game is a small sample size, but the Browns appear to have an NFL caliber quarterback. Kizer is going to make rookie mistakes, but he also has the potential to make amazing plays at any time. His rushing ability is impressive enough to make him almost a weekly starting option. Keep him on the bench for now unless you are desperate at quarterback. If he really clicks with Corey Coleman, Kizer could be a sneaky play though. It is looking like the Texans have had enough of the “Tom Savage Era”. That can only be good news for the entire Houston offense as they did nothing with Savage at the helm. Deshaun Watson often looks lost and/or overmatched, but he has tremendous natural ability. He is probably not worth a pickup at this point, but that may change quickly. The Texans have the offensive weapons for Watson to flourish if he can catch up to the speed of the NFL game. It looked like Hooper could be a great sleeper candidate heading into the season; now he is waking up. He only caught two balls in week 1, but they were for 40 and 88 yards. The longer of the two going for a touchdown. The Falcons have a strong offense with a lot of weapons. That could lead to some lackluster weeks from Hooper. He has the talent and the quarterback to go off at any time, however. If you need a tight end, this is your guy. Clay has a rapport with Tyrod Taylor and the Bills are short on pass catchers. It was mentioned above that the Bills receiving corps lost some pieces. 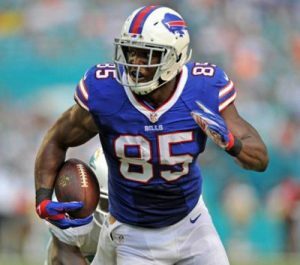 One of the familiar pass catchers for Tyrod Taylor now is Charles Clay. The two got hot at the end of the 2016 season and it has carried over. Clay caught 4 passes for 53 yards and a score in week 1. Games like this have been few and far between for Clay in the past, so be cautious. If this rapport sticks around, Clay might have a big year out of nowhere. Week 1 was a very unusual game for the Steelers in some ways. The stats still count though and James made some serious noise. As Martavis Bryant and Leveon Bell both posted lackluster performances, Jesse James got into the end zone twice. He is the only real threat at tight end and Roethlisberger is clearly comfortable throwing to him. The Steelers have a plethora of weapons on offense, making it tough to choose one on a weekly basis. It certainly looks like James is going to be an option for a fill in tight end, though. 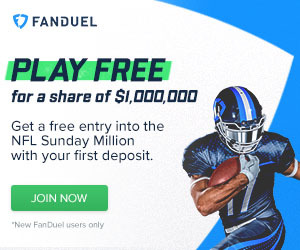 Good luck grabbing the players that you target from the waiver wire. Be sure to check back daily for new content and analysis. Follow us on Twitter for more: @_knuckleheads and @brendancole16.